Lisbon and the Sunny Coast: It's hot! That is just a beautiful shot of a fine-looking dog. The water must have been cooling. Our winter was the worst we've seen in 25 years in Florida...but it was 87 degree F today! Fun! Is the water warm enough if you don't wear a fur coat??!! He sure looks happy enjoying the warm day. What a baby..this one looks very accustomed to the water! Can see why- must be a relief huh! Well, I'm suppose to be gardening through the week..but hey, it rained most of the day! Loved the smaller photos, because you have to scroll across a vertical one. But this is good, too, I suppose. 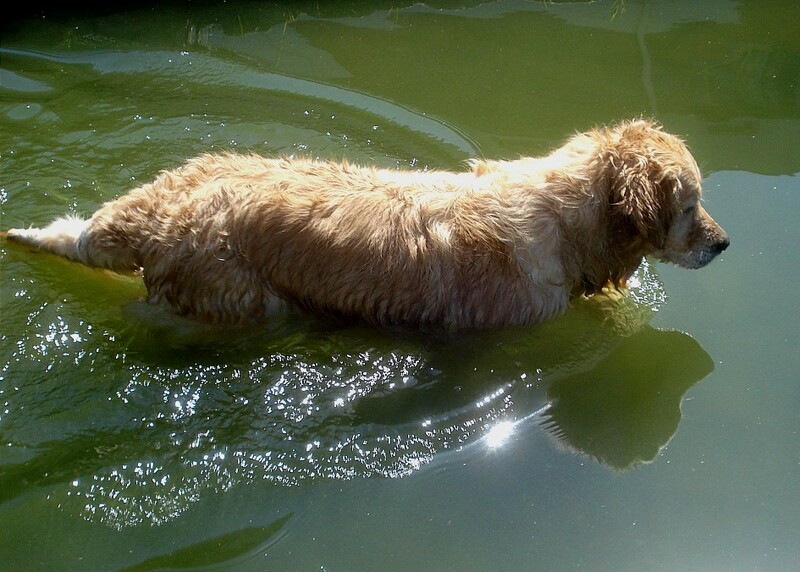 This dog is adorable and he's so concentrating on the water! Glad to hear about the warm weather. We had simply beautiful weekend here too! What's he looking at? You can tell he's on to something! Very nice picture with the colors, reflection, and sun. Glad your bad winter is over. The best is yet to come. What a nice dog! Is it yours?? And it is hot where you are ?? He is a symbol of innocence. Definitely, he said "This is the best." （≧∇≦）ъ "I second that !" Enjoy the warmth while you can and send some here. JM, this is such a perfectly captured moment! Wish you a great and hot week! How cute! It's been hot here too and yesterday I had to turn on the A/C. What a really nice photo. Some of these dogs live for the water. Hopefully the winter will be compensated by a wonderful spring! ... and the dog and all of us will be happy! Great weather both yesterday and today, hoping it will last. Cute picture, refreshing for him and us. Oh what a precious pup! Great photo. Made me smile JM! One very happy dog and a super photo! Don't ask me how you did it but this turned out cuddly as well as crispy and sparkling. Delightful, in fact. I love this image. great reflection shot as well.